Beraca Medical Center has no bathrooms, showers or other general hygiene facilities. Patients must be wheeled to outhouses located outside the hospitals walls. These outhouses are privies without sinks for hand washing or toilet paper. Disease is easily spread from the patients and workers at Beraca Medical Center to House of Hope. 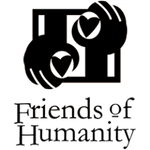 Friends of Humanity volunteers have participated in over 40 trips between 2003 to 2013, providing oversight of projects, training of Haitian workers, program inspections, and acquiring, successfully transporting, and delivering food and water to House of Hope. Poverty goes beyond what is required for physical survival. It includes the lack of what is required for a sense of human dignity. Haitian children survive on nothing. They cannot believe they have worth when the universe has given them so little. Every time a cargo container arrives with donations from friends in the U.S., the people of Port-de-Paix hear the heartfelt message that they are loved and valued. It is impossible to express the significance and importance of this. Hope can sustain people in the most desperate of circumstances. But without hope, the people of Haiti cannot survive. Your compassion tells them, “You count, you are not alone.” It is a reason to survive another day. It is hope. If you come to Port-de-Paix, the welcoming smiles of its people will explain all that can be said about what hope means to them. If you have any doubt whether the world can change or whether you can make a difference, the smiles in Port-de-Paix will renew your optimism. You will find hope for Haiti here too.